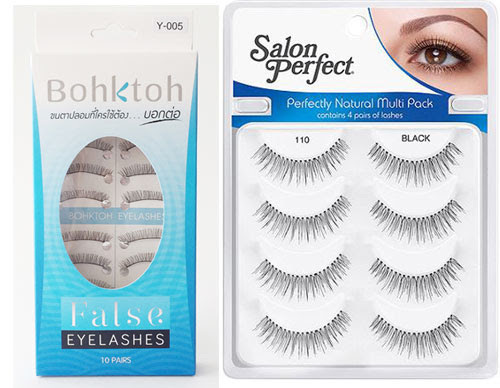 False lashes are like the breathalyzers of the beauty world. Perfectly glued to your lash line and looking soft and fluttery? You’re probably just one or two drinks in. Stuck to the side of your couch where you passed out at 2 a.m.? Pass the Aspirin. It’s rare that false lashes get a second life — but the one they lived the first time around is typically pretty worth it. Most of us know the pain of applying false lashes for a night out, only to cry them off when you’ve had far too much to drink (just me?). Best case scenario: You’ve bought a spare pair of lashes, or you’ve at least remembered the glue. Worst case? Your glue is sat on your bedside table at home. And therefore you shove your lashes away in your clutch and risk ruining them forever. If you’re unfortunate enough to have dealt with the latter, one girl has come up with a solution to ensure you can save your lashes for another day – rather than letting them get crumpled and wrecked at the bottom of your bag. 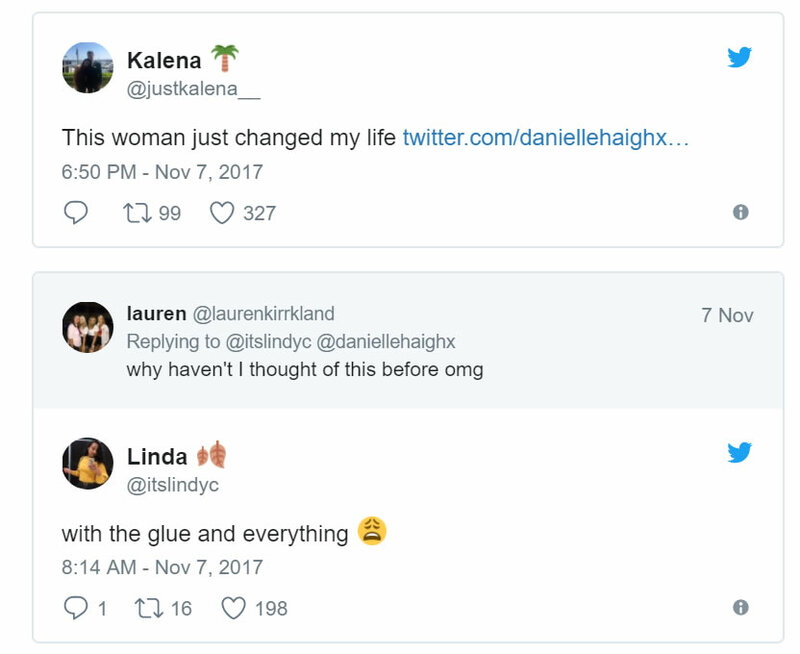 This Twitter user has found a genius trick for extending the shelf life of her strip lashes — and it includes something you probably haven’t thought of since turning 21: Kinder eggs (also known as Easter egg). 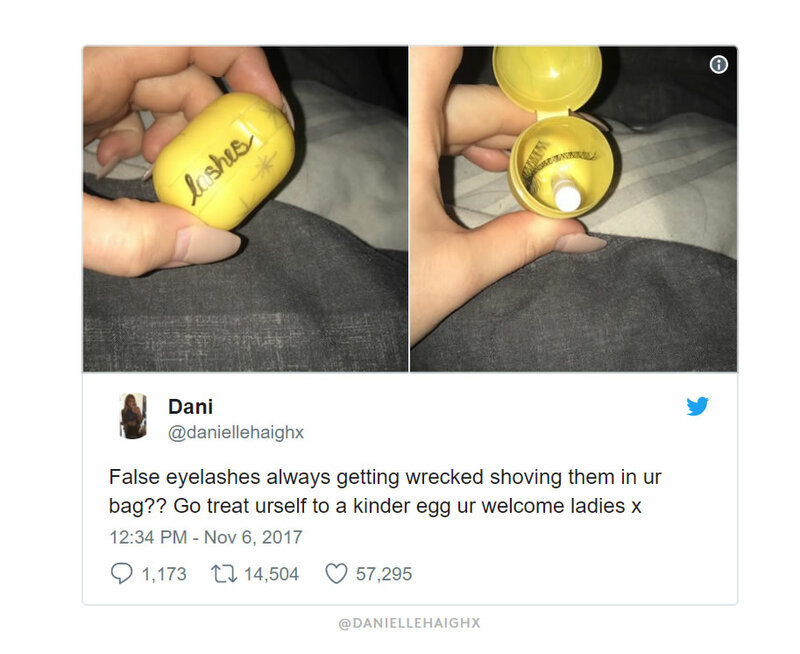 Twitter user @#daniellehaighx, who goes by Dani, posted a photo of a Kinder egg labeled “lashes.” She explained that instead of storing jelly beans inside, she keeps her falsies and a tiny tube of lash glue in there to keep her strips from getting smashed in her bag at the end of the night. Is it too late to submit this person for Beauty Innovator Of The Year?! Of course, Dani’s suggestion of using empty Kinder Egg containers isn’t as useful for American makeup lovers — the toy-filled candy has been banned in the United States since the 1930s for being a choking hazard. But hey, where there’s a will there’s a way — and if reports are true, they may be available in America sooner than you think. After the post, the Twitter-verse shouted their support for the pro tip with 60,000 likes and more than 15,000 re-tweets. In the tweet, Danielle explains how she’d purchased a Kinder Egg (Ester Egg) and used the yellow pot found in the middle to safely guard her false lashes. 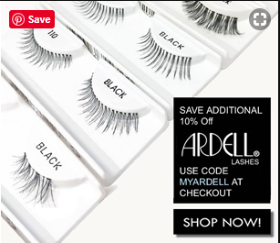 And while we never really saw a gap in the market for eyelash storage before, the reaction to this Twitter post might change that. 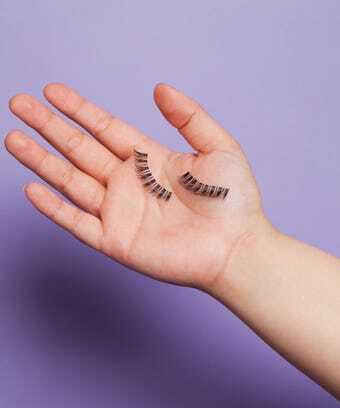 Time to say a prayer for all the lost fake eyelashes, and then add this smart idea to your toolkit. We’ll cheers to that.